As painting on my Infinity models continues when I have the time, I have decided to show off in greater detail models I'd previously finished. 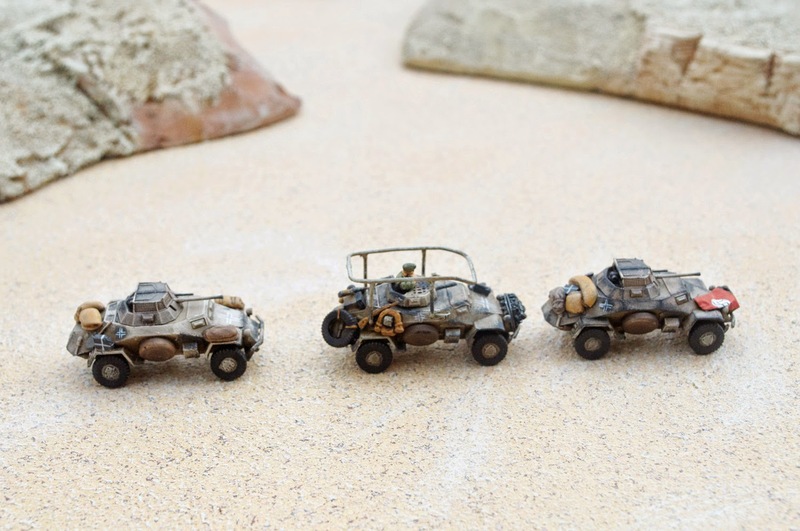 The Plastic Soldier Company is doing a monthly painting competition, and I decided to submit a patrol of DAK cars. Almost all the stowage on the vehicles is my own conversion. The Jerry cans on the 223 are plasticard; all wound by modeling wire as a tow cable; extra Jerry cans strewn about along with puttied tarps and rolls; a tinfoil Nazi flag; and a customized (plasticard) MG turret on the 223. The rifle on the 223 is from a spare that came with another PSC kit, as is the spare tire (you have to look closely to see it doesn't quite fit the vehicle, being made for a Hanomag Kfz. 251). The entire patrol was done up with the DAK typical sand colour, and had grey sponged on to look like the sand colour being rubbed away. 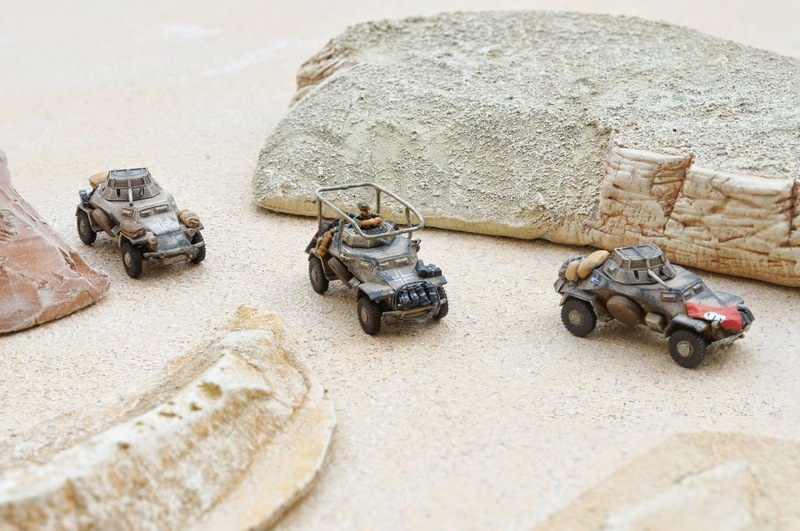 The vehicles often showed up in the desert the typical German grey, only to be hastily covered with any sand-coloured paint the troops could find. Since it was applied in bad conditions, any use, bumping, or rubbing would cause the paint to flake off, so high edges and common crew handholds would go back to being the basic grey. It's a uniquely German thing, and helps to make their vehicles stand out from the others. Soon, more Infinity, I promise. I've done some work, not really finishing off anyone, and just need to photograph them. Here's hoping the 222s win!